We always like to try the local wine when travelling. Croatia has some lovely indigenous grape varietals that produce white wines a little different to your usual chardonnays and sauvignon blancs. Notice how much our choice has generally been reduced, in a kind of middle-of-the-road way. Safe and ubiquitous. But in this country the grapes tend to be specialised for individual locations. Terroir still matters. On Hvar, we have the white wine grape varieties Bogdanuša (Bog-dan-oosha) and Prč (saying it’s pronounced Prrrch doesn’t really help, does it? OK, try Purch), that I don’t believe are grown anywhere else. Bogdanuša makes a lovely, quaffable lunchtime or early evening drink for enjoying on the terrace. It’s delicate, like a light aromatic muscat – very pleasant. Several of the Hvar wineries have their own version, including Plančić, PZ Svirče, Tomić, Carić and our own local Pinjata. Prč mostly appears in blends, though Plančić‘s Parč is a single varietal version. Also from the island of Korčula, we have Grk (no really, you don’t need a vowel – say after me: Grrrrk), which makes a dry, aromatic white wine. And from far out to the west, we have Vugava, the white wine of the island of Vis. This is another local grape varietal from a place with a long, long history of wine-making. Another Croatian white wine I like a lot is Graševina (Grashevina – getting the hang of š = sh yet?) which is produced in the more northern areas. Look for Krauthaker’s Graševina for one of the very best. 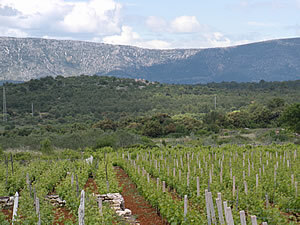 The Dalmacija Wine Expo will be held in Makarska April 29-30, 2011 in the Sports Hall. This event, only in its second year, is a wonderful opportunity to taste the best of the area’s wines and learn where to find more! Their website is hopeless, still talking about last year, but the actual event was well organized and fun! The Hvar Wine Festival in September last year, was a lively event with food and live music. A great chance to meet and talk with the island’s wine makers. Hopefully to be repeated in 2011! The new Hvar Winemaker’s Association was set up in 2010, and we look forward to supporting their efforts! ← What did the Greeks do for us?